Circle within circle, ring within ring, to the mystic heart of the magical craft of the mysterious Beldama Wyrd. 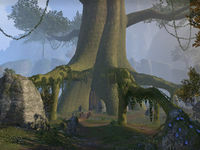 The Beldama Wyrd Tree is a secluded glade in the forests of Daenia in southern Glenumbra. The Wyrd Tree itself, at the center of the glade, has been infected by the Bloodthorn Cult, disrupting the balance of nature throughout Daenia. The Wyrd Sisters also have their main camp set up here. Beldama Wyrd Tree Objective: Remove Angof's corruption from the Wyrd Tree. 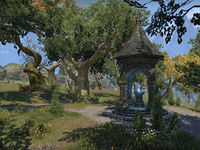 Wyrd Tree Wayshrine is located on the road southeast of the glade, not far from Dresan Keep. 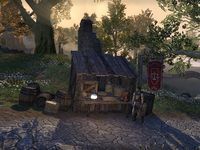 The Guild Kiosk Mogazgur's Mart, run by Mogazgur, is just to the east of it.